The Discharge Gas Control Panel (DGCP) for line temperature and pressure control only. 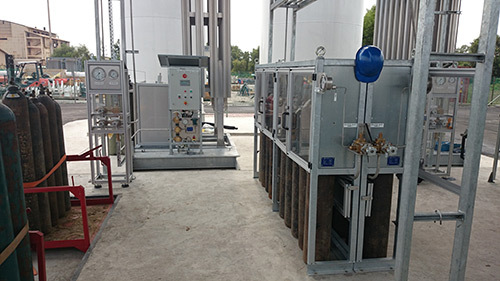 The Buffer Skid for temperature, pressure, and buffer capacities control. To increase the production capacity by 15 to 30% in decanting the pressurized gas from the buffer to the empty cylinders at the beginning of the filling step. To absorb the liquid expansion (from the vaporizer and the line) when pump stopped. To extend up to 30% the lifetime of the pump by reducing its numbers of starts & stops cycles. To fill low percentage components without starting the pump.